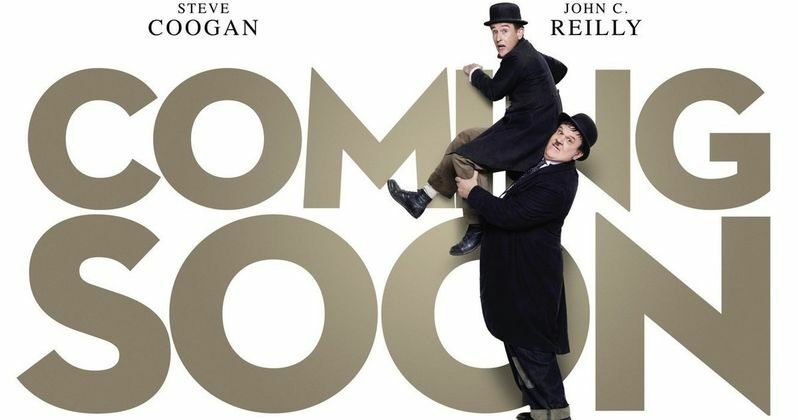 The first trailer for Stan and Ollie is here. Biopics are and pretty much always have been a major staple of the fall and winter movie seasons, which is when studios tend to put out movies that they hope can garner some love during awards season. While it's early to say, and it looks like there is going to be a lot of fierce competition this year, this biopic about the legendary comedic duo of Laurel and Hardy looks like it has Oscar love written all over it. Steve Coogan and John C. Reilly star as the famed comedians. This is taking an interesting approach, choosing to focus on the duo's later years, as opposed to being a more traditional rise and fall type biopic that chronicles their entire journey. Both actors look great in their respective roles, but Reilly went through one heck of a transformation here. The trailer itself takes us on an almost complete emotional journey, with many of the story beats laid out quite plainly. It will be fascinating to see that play out over the course of roughly two hours when the movie actually hits theaters. This helps cap off a pretty amazing season for John C. Reilly. Not only does he have this coming out, but he's also earning a lot of praise for his western The Sisters Brothers. Plus, he's reprising his lead role in Wreck-It Ralph 2: Ralph Breaks the Internet later this year. To top it all off, he's reuniting with Will Ferrell for Holmes and Watson in November. Reilly is having himself a moment, that's for sure. Could he be adding Oscar nomination to this year's list of accomplishments? Stan and Ollie will tell the story of the group's farewell tour in 1953. This is the first time that the story of Laurel and Hardy is being told on the big screen. With their best days long since past, the pair embark on a variety tour of Britain and Ireland. They will face the pressures of a hectic schedule, but that comes with the support of their wives Lucille (Shirley Henderson) and Ida (Nina Arianda). During the tour, despite quite a bit of hardship, their love for one another and their fondness for performing helps to get them by. Jon S. Baird (Filth) directs with a script from Oscar-nominated screenwriter Jeff Pope (Philomena). Sony Pictures Classics is distributing the movie and they currently have a January 11, 2019, release date set in the U.K. However, their release plan for the U.S. hasn't yet been revealed. Though, they will certainly, at the very least, get it in a few theaters in order to qualify it for the Academy Awards, with a wider release possibly taking place early next year. Be sure to check out the first trailer for Stan and Ollie, courtesy of the Entertainment One UK YouTube channel, for yourself below.